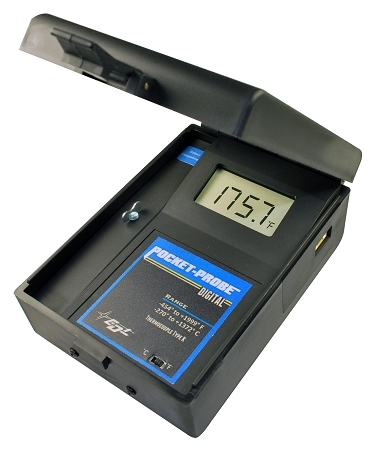 The Pocket-Probe® Digital Pyrometer is engineered to be rugged, reliable, and consistently accurate with repeatable measurements. These pyrometers feature full range measurements and offer 0.1° resolution up to 199.9 °F or °C. Perfect for use on the production floor as well as in the lab! Made in the USA, this pyrometer is constructed from the finest materials and is backed with an unconditional 5-year warranty! * Max. Temperature for T is 400 °C. All EDL Surface Sensors come standard with a 32” lead with Stainless Steel overbraid. EDL’s Metrology Laboratory can supply any sensor and instrument complete with a report of calibration that is traceable to NIST. Dimensions 5.75" x 3.9" x 2.2"